Nick Holder, owner of Toronto's acclaimed DNH Records (now up to over 60 releases! ), has been producing underground house music for the last ten years. As well as releases on his own DNH label, Holder has also produced respected EPs on John Acquaviva's Definitive label, Stickman Records, Hi Bias, Strobe Records and Germany's K7 label (two albums; "One Night In The Disco" and "Back On Track"). Nick's recording work spans the house sound through to disco loops and minimal Chicago style, and his work has found their way into the record boxes of such DJ luminaries as Deep Dish, Andrew Weatherall, Nick Warren, Junior Vasquez and DJ Sneak. 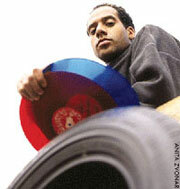 Holder's single, 'Da Sambafrique' propelled him to cult producer status, a latin track played by DJs all over the world. This record was to set the precedent for Holder's critically acclaimed album on NRK, 'From Within' and spawned two underground classics; "Trying To Find Myself" and "I Once Believed In U". Last year saw the release of Nick's second album for NRK. Titled 'Underground Alternatives', the album featured the new singles 'America Eats Its Young' and the huge Summer club hit, 'Summer Daze'. The album received amazing reviews from the music press, and received the Album Of The Month accolade in UK, France, Canadian and Australian magazines.